The arrival of spring has encouraged me to take a break from traditional Easter baking and share a whimsical treat with all of you. 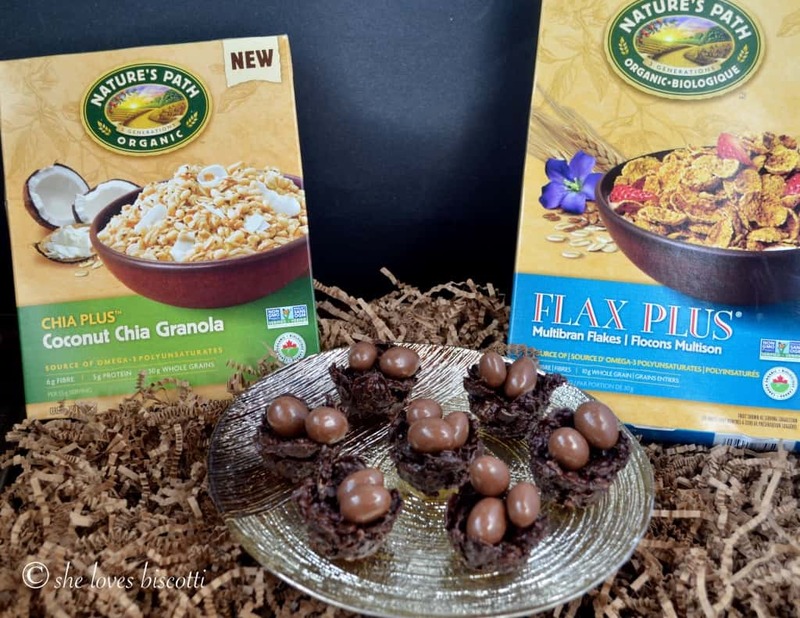 These Chocolate Granola Easter Egg Nests taste great, are a fun, somewhat healthy treat to make with kids, and they are a great conversational piece. Every year, the signs of spring are eagerly anticipated by all. I am no exception, except for one sign. I anxiously keep peeking out of my backyard patio door, watching for robins. Don’t get me wrong, I love robins. I’ve been living in the same house for 30 years and for 30 years robins have set up their nests in and around the garden and on the backyard trees. And every year I watch in total amazement and in awe of nature. But last year, I had a little situation when a robin tried to set up his nest in my backyard porch, inches from my patio door… AKA, the entry to my house. It’s a funny story, actually – when I spotted mud and twigs and straw on my porch, I looked up and I realized I was being stared down by a robin! That was a little too close to home…my home! I knew that robins are extremely territorial, so before I had any of them taking over my house, I attempted to dismantle the very beginnings of a nest. I have to admit I was impressed by this robin’s persistence. Would you believe that for an entire week, this robin tried to set up shop on my porch? In the morning, before I went to work and in the evening, as soon as I got home, I was dismantling a nest. Talk about persistence! 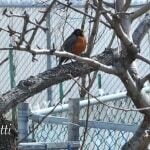 Eventually, my robin friend gave up and chose to nest in the pergola of grapevines I have in my backyard. Did you know that it takes a robin 2-6 days to make a nest? 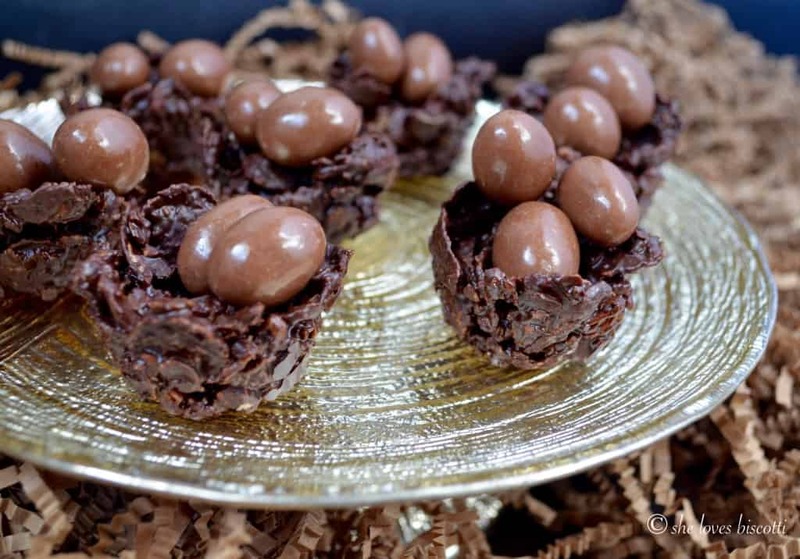 I assure you it will not take you that long to make these cute little Chocolate Granola Easter Egg Nests! There are only 3 ingredients in this recipe. We will try to imitate nature’s perfect nest using chocolate for the mud and a combination of Nature’s Path Multibran Flakes and Coconut Chia Granola for the twigs, straw, and everything else that goes into making a nest 🙂 And just in case you are wondering, the “eggs” are chocolate covered almonds. A few months ago, I received some complementary cereal packages from Nature’s Path. If you are not familiar with these products, I would invite you to read up on the company and the wonderful products they have (Here is the link). If you are like me, you will be hooked from the first bite. It being the first day of spring, I thought of my robin friend as I was having my breakfast of Flax Plus Multibran Flakes (because as you know we should all be eating more fiber ;p). And that’s where the idea came to me. 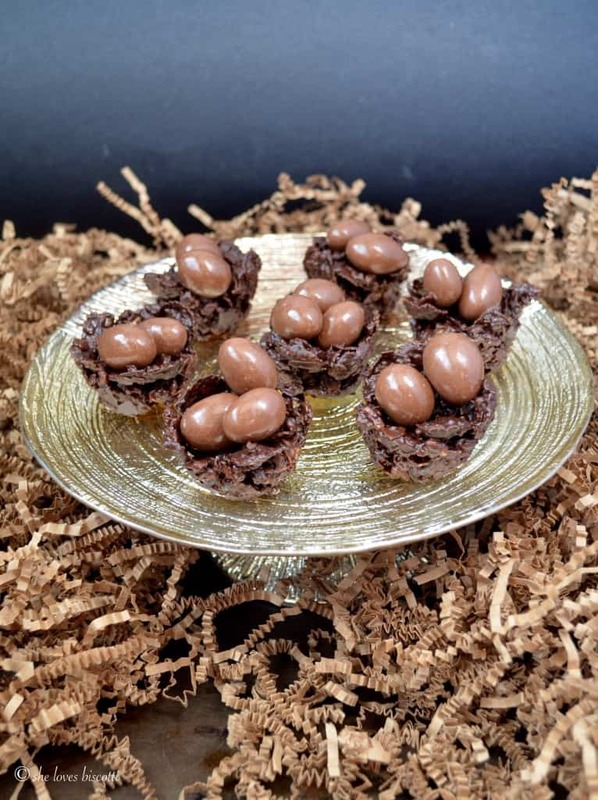 I thought it would be fun to make little Chocolate Granola Easter Egg Nests made of my favorite cereal to honor my robin friend and to welcome spring! 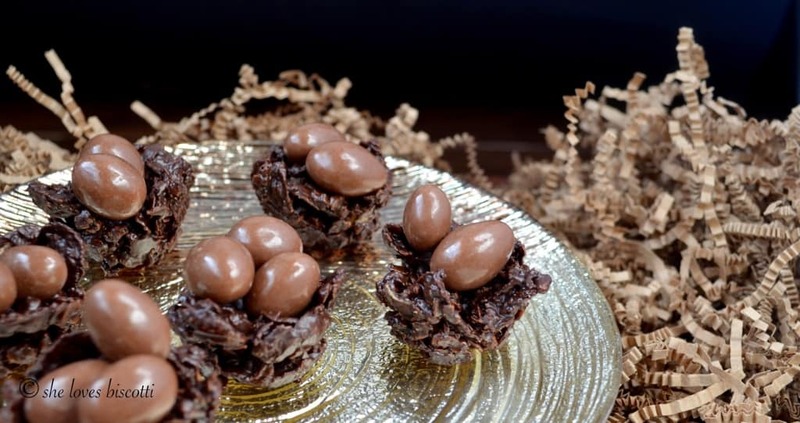 Chocolate Granola Easter Egg Nests- a treat made with organic cereals & chocolate in the shape of a nest. Enjoyed by the young & the young at heart. In a heatproof bowl set over a pot of simmering water, melt the chocolate. Gently combine the flakes and the granola until completely coated with the chocolate. Mold the mixture on the inside of your mini muffin tins. Make a small indentation in the middle of the chocolate. Place the muffin tin in the fridge for about 30 minutes or until set. Fill with your favorite "treats". Keep in cool place until ready to serve. Recipe can easily be doubled if more "nests" are required. 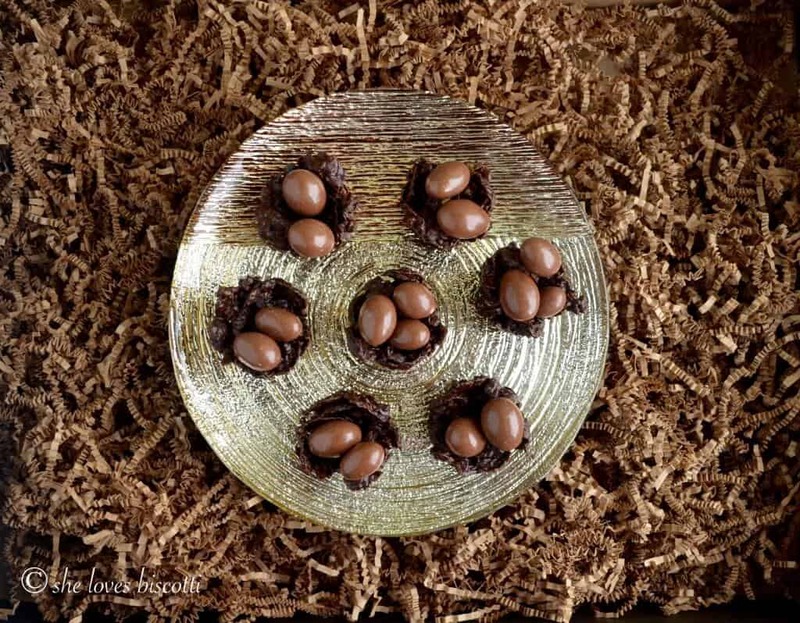 There is a waiting time of 30 minutes, as the chocolate nests cool off in the fridge. Disclosure: I have been provided with a complimentary cereal packages from Nature’s Path. I have not received any monetary compensation for this review. Views and opinions expressed in this post are entirely my own. What a cute idea! Love your robin story! Your work is always so clean and perfect. Love this simple, but adorable idea. Thanks and Happy Easter! I will try this one, for Easter of course, not because I love chocolate.